I remember taking my oldest daughter to the playground as a toddler and coming home completely exhausted. From pushing her on the swings to holding her up to do the monkey bars and chasing her around as she ran from one slide to another, her play depended on me and the playground equipment working together to entertainer her. I have since found a better way of inspiring free play outside and it usually doesn’t involve a playground. But there are times when my kids beg to go to a park with a playground, and I’m happy to take them. 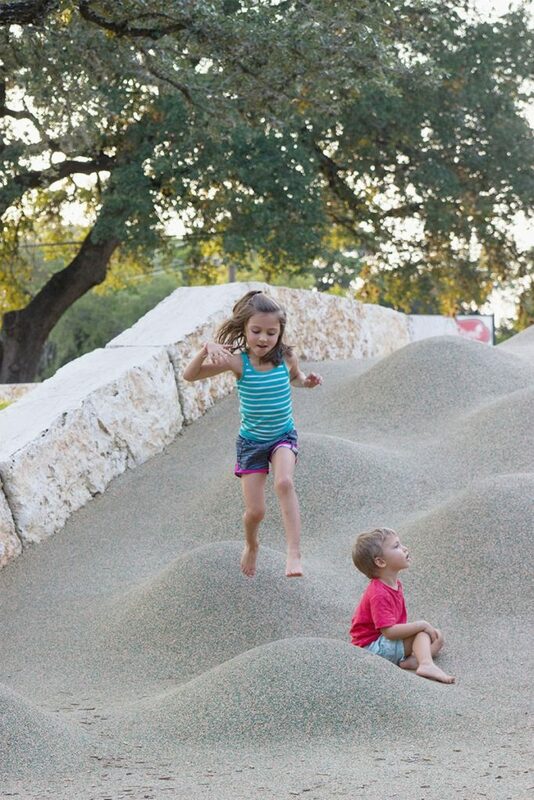 Our favorite playgrounds are immersed in nature in a way that makes the playground equipment and extension of nature and not a distraction from it. 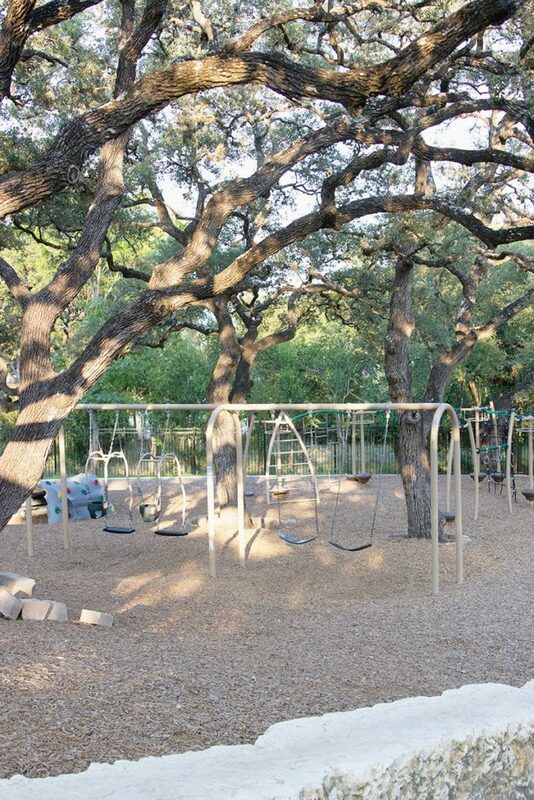 Whether it is nestled among the trees or has a natural mulch ground covering, having some element of nature gives a playground a more calming effect. 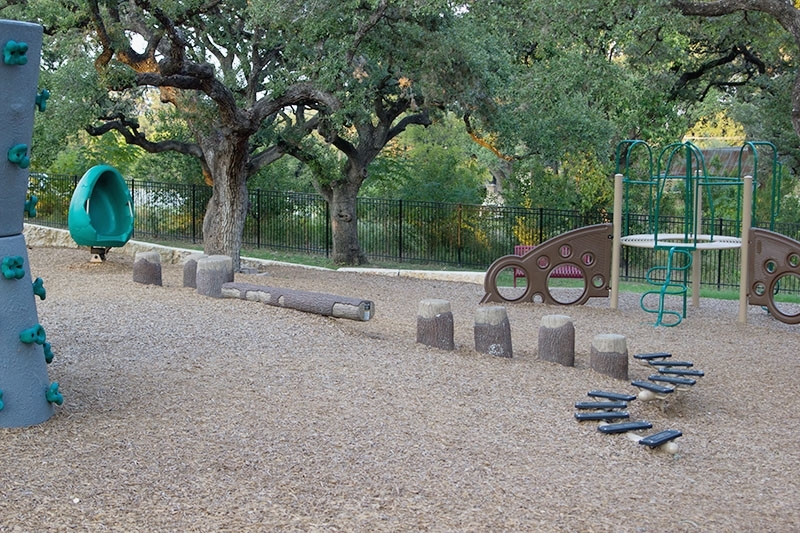 I also find that great playgrounds skip the brightly colored equipment and opt for more natural browns and grays instead. So many children these days are suffering from sensory processing disorder, and the bright colors can add to the visual clutter instead of serving as a sensory outlet for kids. A great playground doesn’t have to be huge, but there should be room to explore freely, both physically and figuratively. A patch of grass, a slide tucked behind a hill or a few randomly placed logs all invite children to use their body and imagination in ways not obviously prescribed by adults. 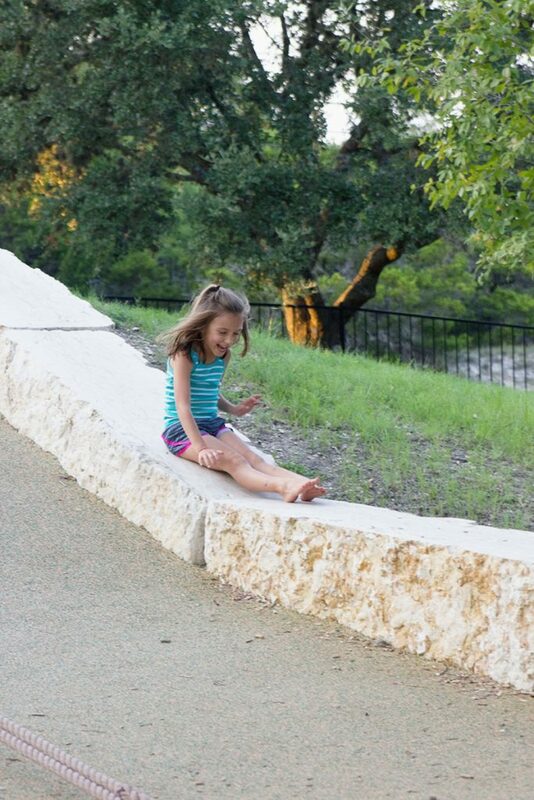 Wide open space calls for a game of tag, cartwheels or leapfrog. A low canopy might become a bear’s den or a gloomy cave.When a playground has room to explore, opportunities for play increase exponentially. On our visit to the playground this week, there was a fantastic slide tucked into a big hill. I saw my kids go down the slide the traditional way a few times, but then they invented about 20 other ways to use the hill. They went up the slide, made tunnels for each other while going down the slide, leap frogged on the moguls, and slid down the retaining wall. Nobody told them to do those things, but that’s how play can evolve when you allow it the room to do so. Politics and fears of lawsuits have changed the landscape of playground equipment over the past several decades. New safety guidelines that aim to reduce the number of accidents have put limitations on the creativity, challenge, flexibility, and natural features of outdoor spaces. There is some research that shows more accidents may happen on “safer” equipment because children use the equipment in unintended ways. 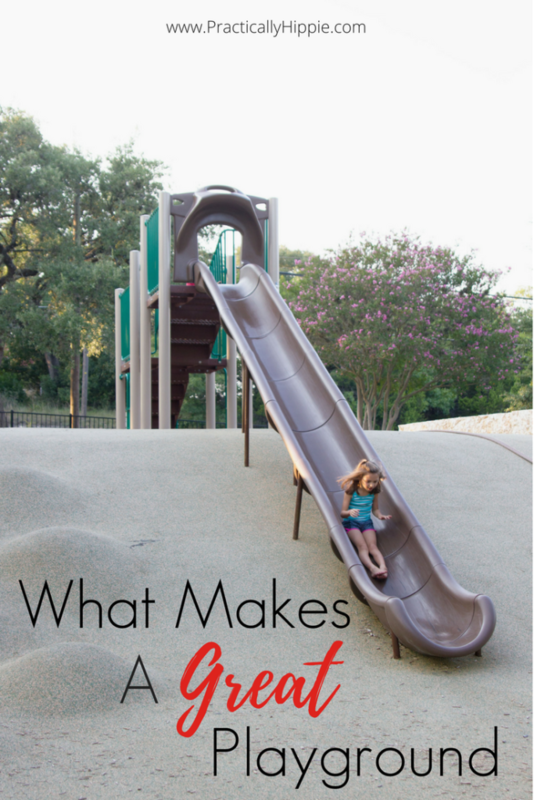 Kids need to be able to test their limits on the playground, but they also need a way out. 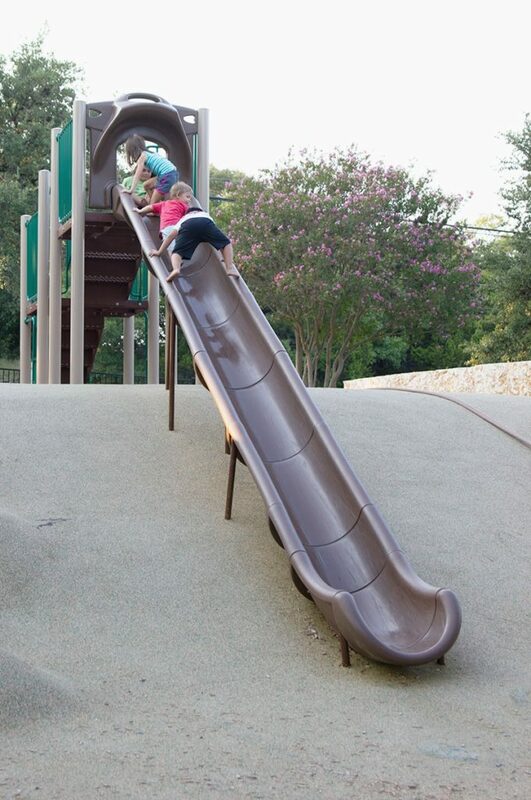 Good playgrounds might have a climbing structure with a variety of ways to get down including stairs, a rope ladder, a slide or a sliding pole. Children are amazing self-regulators and most children 3 and up will be able to determine their own skill level and which route suits them best. There have been numerous studies documenting the need for risky play. In our family we have two rules that help us to manage risks on the playground. The first is that they can play wherever they can reach on their own. I won’t pick my 3 year old up and put him on a climbing tower or help my 6 year old reach the top of a rock wall. They have free reign as long as they can do it themselves. Our second rule is that they shouldn’t jump from a height taller than they are. I borrowed this rule from a friend and it’s been great for my more adventurous child. These are my qualifications for what makes a great playground. I’d love to hear yours! Want to see more tips and ideas for getting kids outside? Follow me on Pinterest!